Where's David Lee Roth when you need him? This review first appeared in the August 26, 1988 issue of the San Diego Evening Tribune. Masters of Rock? Maybe once, but no more. To be honest, plenty of us were satisfied when Eddie Van Halen asked former lead singer David Lee Roth to excuse himself from America's most popular rock band. Roth's infatuation with himself had grown beyond obnoxious. Roth's relative failure as a soloist was also satisfying to many rock fans tired of his preening and strutting; a welcome bit of comeuppance. When veteran rocker Sammy Hagar signed on with Van Halen, word was now Roth would see how the band had carried him. Van Halen's first album with Hagar, "5150," easily outsold Roth's EP and follow-up album, giving credence to the argument. 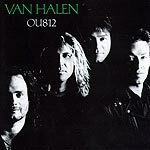 Yet while this, Van Halen's second album with the new lineup will no doubt also sell into the millions, "OU812" also offers discomfiting hints that just maybe Roth also carried Van Halen. "OU812" continues some sorry trends begun on "5150." Both albums alternate between slow ballads (can you imagine Roth even singing a ballad?) and medium-tempo rockers  with none of the kick-in-the-shorts songs that made Van Halen the band famous and Eddie Van Halen a guitar hero. There is no song that cuts loose like "Panama" or explodes like "Running With the Devil." The best pure rocker on the new album is "Mine All Mine," which has a suspense-building intro that growls like the Concorde readying for takeoff. Alex Van Halen's patented drum begins to accelerate, Michael Anthony's bass lines start to rumble, Eddie's guitar seems ready to take off and ... nothing. NO climax follows  the tune just seems to fall back into a non-energetic morass. To be sure, not every album Van Halen made with Roth was great  "Women and Children First" and "Fair Warning" come to mind  but even the bad ones contained at least one redeeming song, an "Unchained" or "And the Cradle Will Rock." "OU812" offers no such redemption. After "Mine All Mine," we get "When It's Love," a boy-meets-girl ballad of the type that Roth would have sneered at and handed off to Toto. The melody is syrupy, the lyrics banal. "A.F.U. (Naturally Wired)" rocks some, but like "Mine All Mine" sort of peters out. The songs on Side Two were put there for a reason, and could be cut-outs of any minor-league headbangers jam session. If "Mine All Mine" is the best rocker on the album, the actual highlight may be an unpretentious song called "Cabo Wabo." In best Van Halen tradition, "Cabo Wabo" is about partying in Mexico. The band seems comfortable here, Hagar isn't trying to imitate Roth for a change, and, best of all, the song itself is catchy. It's just not enough to salvage the album. The only notable area of "OU812" is Eddie's continued development as a guitarist. No longer content to vie for the title of world's fastest rock guitarist, he is now exploring nuance and shading  the richness one can find not by playing the most notes, but the right notes. Of course, for longtime Van Halen fans, there are one or two vintage EVH solos included, but in light of his growth, they seem pointless. He's already done it all in the heavy metal scale-racing style, and has nothing left to prove there. Something is definitely missing from Van Halen, and it just might be David Lee Roth. In spite of, or perhaps because of, all the rude antics and memories that still make one wince, Roth gave the band a spark that is sorely needed now. If the band issues any more bricks like "OU812," Van Halen may permanently relinquish the title of Masters of Rock.